Grandma's House is a century old home built in 1860. We have four rooms with two shared baths. Each room includes a queen and a twin size bed. A common room provides a comfortable place to relax and enjoy warm conversation or television for entertainment. You are also welcome to enjoy the swing on the front porch with a refreshing drink. We are WiFi ready if you bring your laptop computer or other electronic devices. The common room offers three comfortable chairs and a cozy couch to enjoy good conversation by a warm fire. There is a flat screen, cable TV to watch your favorite program or movie. Several books of all genres are also available for your reading pleasure. A small box of toys will entertain kids of all ages. A large dinning room table offers plenty of room for everyone to enjoy a wonderful country breakfast prepared every morning by "grandma" herself, together. Coffee and a variety of goodies are available around the clock. All food allergies and special requests are always respected. Simply contact us in advance to ensure for a proper menu. The kitchen is open to you to store any perishables you may have. The Mauve Room has a queen size bed with plenty of hand made quilts for your comfort. Relax by the fireplace and watch TV before drifting off to slumber. A queen and twin size bed in the Blue Room is just the right size for your family to be comfortable together. A large dresser and closet offer plenty of space for your belongings. You can enjoy watching a little TV while nestled in the comfort of this queen size bed. Your child will sleep well on the comfortable twin bed in the Green Room. There is a dresser and an antique armorer for your clothes. Enjoy the fireplace in the inviting Peach Room. It has a comfortable queen bed and twin bed with plenty of space for three people. Two dressers are available to keep your clothes and belongings tucked away during your stay. A country breakfast with all the fixin's will be ready in the morning. If you prefer something on the lighter side, or have a special diet, simply let Grandma know when you make your reservation. "We shared a room at Grandma's House during the Unity Festival in Muskegon, Michigan. We could not find a reasonable hotel near Muskegon so we chose to drive to Rockford. 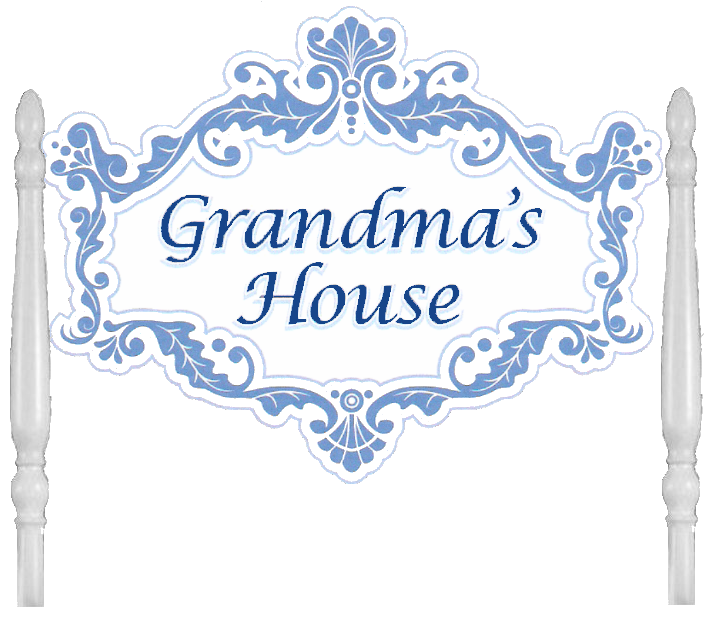 We were pleasantly surprised at the cleanliness, the comfortableness and the hospitality at Grandma's House. The prices were very reasonable. Our room contained a queen size and a twin size bed. The rooms were very quaint with quilts and antiques. The house was very neat and clean. Beds were made with crisp clean sheets all tucked in with hospital corners! There were plenty of pillows and beds were very comfortable. The bathroom, which would be shared by all guests was neat and clean, equipped with extra towels, washcloths, soaps and shampoos along with Dixie cups. Grandma fixed us a nice breakfast of French toast, sausage, orange juice, milk and coffee and was fixed at the time we were able to choose. My granddaughter took full advantage of the swing on the front porch. We would definitely stay here again."